Well no surprise here. 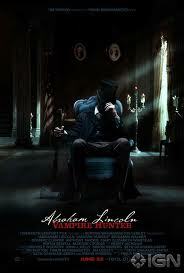 The critics don't exactly LOVE Abraham Lincoln Vampire Hunter. This one from Michael O'Sullivan at the Washington Post is among those who actually come out in favor of the film. While not all the reviews are in, the film is scoring a measly 37% from the critics at Rotten Tomatoes while the audience is more generous with a current 75%. It will be interesting to see if those numbers change. As many of you know, my husband was first assistant director for second unit, he worked on the large scale battles which utilized civil war re-enactors rather than extras. It's always disappointing to work on something which falls flat; hopefully the audience will enjoy the film as the wild and crazy ride it was intended to be. Otherwise, Abe Lincoln might have to come after the critics with his super-axe! I would love to know what YOU think...especially if you've read the book. As much of a mixed bag as its portmanteau title suggests, “Abraham Lincoln: Vampire Hunter” is both terribly silly and a lot of fun. Delivering fewer consistent frights and more laughs than some might wish from a flick about bloodsucking ghouls, this adaptation of Seth Grahame-Smith’s 2010 bestseller is nevertheless reasonably gripping summertime entertainment. That’s thanks in large part to filmmaker Timur Bekmambetov’s strong sense of action and visual style. The Russian-Kazakh director of the arthouse vampire twofer “Night Watch” and “Day Watch” pays as close attention to details as to the big picture. Arcs of spurting vampire blood -- as black and viscous as Cherry Coke syrup -- are as carefully choreographed as the action sequences. One set piece features a horse stampede during which the ax-wielding hero (Benjamin Walker) does gymnastic battle with the vampire (Marton Csokas) who has killed Lincoln’s mother (Robin McLeavy). That biographical detail, apparently, was left out of most history books about the 16th president (though it may have found its way into Bill O’Reilly’s “Killing Lincoln”; I’m not really sure). Bekmambetov imbues “Lincoln” with the sepia look of old Mathew Brady photos. It’s effective, even if at times it contributes to an overall murkiness necessitated by the film’s 3-D technology, which is largely wasted on gimmicks such as flicking the tip of a slaver’s whip in your face. Speaking of gimmicks, the premise is one colossal contrivance. According to the book and film, Lincoln’s motive of vengeance evolves from the personal to the political when the shopkeeper-turned-lawyer-turned-statesman realizes that the institution of slavery was created as a way to feed white Southern vampires, resulting in the Civil War. Strangely enough, it works. Internal logical consistency is all any lover of vampire films asks for. And the admittedly ludicrous conceit, while one giant metaphor, is, for the most part, airtight. Despite the addition of such non-canonical vampire attributes as invisibility, the film generally respects tradition. Vampires’ aversion to silver (their version of Kryptonite) is a pivotal part of the film’s spectacular climax, which involves the Battle of Gettysburg, as well as a clash between the hero and the vampire leader, Adam (Rufus Sewell), on a train hurtling over a burning trestle. The film’s twist ending -- which is based on multiple meanings of the word “railroad” -- is nicely satisfying. As Lincoln, the Juilliard-trained Walker falls just on the dull side of what one expects from an action hero. While good at evoking the awkward, unsexy suitor of Mary Todd (Mary Elizabeth Winstead), he seems an oddly wooden choice to play someone who dispatches vampires with a silver-tipped ax wielded like a majorette’s baton. That incongruity is front and center in the film’s oxymoronic title. Bekmambetov doesn’t hide from it, but rather leans on it, encouraging more giggles than are strictly necessary. Still, Walker makes for a weirdly uncharismatic hero, particularly when he’s on screen with his mentor, Henry (Dominic Cooper), who oozes intensity and menace as Lincoln’s martial-arts sensei. The competent supporting cast includes Jimmi Simpson as real-life Lincoln confidante Joshua Speed, Alan Tudyck as Lincoln’s main political rival, Sen. Stephen Douglas, and Anthony Mackie as Lincoln’s freeborn African-American friend, Will. The pursuit of Will by vampires intent on harvesting him as a food source plays a major role in catalyzing the film’s hero; at one point Will seems like Robin to Lincoln’s Batman. Which brings me to the one aspect of the film that doesn’t really add up. (Yes, only one, but it’s kind of nagging). As with most vampire stories, a bite from a vampire will turn the victim into another vampire -- unless, as Adam explains, the person bitten is pure of heart. Those rare, unblemished souls simply die, which is presumably why Lincoln’s mother did not become a vampire. My question, then, is this: Why are there no black vampires? Surely there is one slave, somewhere, whose heart has been hardened by injustice and the lash just enough to grow fangs. Contains violence, gore, obscenity and brief sensuality. Well, I didn't finish reading the book 'cause it creeped me out, and I don't like to read books that make me feel that way, but SIGN ME UP for the movie. Can't wait to see it! Yeah, I didn't finish Fifty Shades of Grey for that same reason! LOL! But no way I would want to see that movie. But seriously I didn't finish the book either. Mark and I are seeing the movie tomorrow; I'm hoping it's a bit of fun!